This short EP from black-death band Mefitis reinjects the potency of narrative sorely gone missing from modern black metal, calling to mind the emotionally layered tapestries of such classics as Dissection and Dawn. Where your garden-variety “orthodox” band today uses pseudo-scriptural mumbo jumbo and overt yet ultimately redundant dissonance in a misguided attempt at appearing substantial and evil, Mefitis, along with other contemporaries like Beithioch, Uruk, and Into Oblivion, are actually telling stories through music. The medium of expression may differ, but all of them grasp an elementary truth, that the language of music is fundamentally different from the language framed by words. There can be subliminal overlap between the two, and such overlap can even enhance the experience in the final reckoning, but the manipulation of musical tones when considered in isolation shades the consciousness in an entirely unique manner. As the English empiricists were wont to pronounce, this in essence is the distinction between impression and idea. Music lends to impression and figure, and leaves the listener to his predilections when it comes to the filling-in part. Words, then, necessarily follow in the wake of those initial impressions, and are in fact the intellectual faculty’s attempt at bringing the raw sentiment of impression into tangible form. Mefitis, and all good metal, understand this order of precedence instinctively: music comes first and therefore is purest, while words and images only supplement. The band’s hold on tone and harmonic interplay holds great promise for the future, but equally impressive is their sculpting of musical space. Not solely from a production or acoustics standpoint either, but in the sense of the song as a palpably geographical-topographical unit. Classical music achieves this detailing best, so does the best black metal, where each individual voice constitutes an indispensable feature of the landscape. 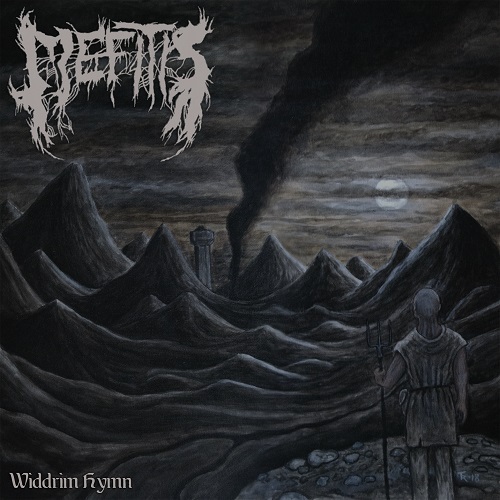 Mefitis choose to make that landscape overwhelmingly saturated with sulphur and ash as befits their genre, but as is true for natural geography, however foreboding, their music is never without a gradually accumulated internal logic. This entry was posted in Black Metal and tagged Black Metal, Mefitis, Widdrim Hymn. Bookmark the permalink.